Dave had to work this weekend. I admit, I was sort of delighted to have all that time to myself, and I was very productive. With the knitting. Not with the actual work. Let's be realistic here. But Saturday I did not knit. (Or I did not knit much). I decided to give Dave a super-special surprise when he came home, given that he was spending all day working. 9:00 AM: Clean furiously. My heavens do the kids have a lot of stuff. Make several trips up and down the stairs putting said stuff away (i.e. in their room. "Away" doesn't really exist). 9:45 AM: Mop the floor in the dining room where it looks especially dirty (hint: it's not where Dave and I sit). 10:30 AM: Clean my bedroom. Note that this time all the mess really is all my fault. I really need to hang up my clothes rather than just throwing them on the chair. 11:00 AM: Hear a baby crying outside. Go hold the baby. Chat with neighbors, and continue to do so even after the baby gets taken away. Try to decide if I am being friendly or merely procrastinating. 11:45 AM: Have socialized/procrastinated enough. Get back to work. 12:15: Have finally finished. Am starving. Heat up several-day-old quesadilla, and bemoan the fact that we have no more guacamole. Resignedly eat several-day-old quesadilla. 12:30 PM: Flip through several cookbooks. 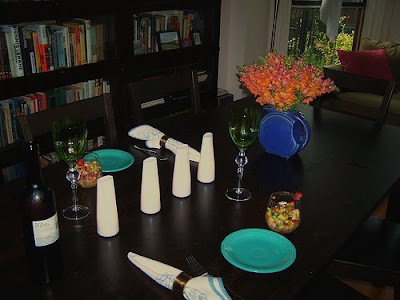 Want to make a spectacular meal for Dave. Am unimpressed by the normally very impressive Nigella Lawson. Part of the problem is that I really desperately want fish, and her idea of fish is gravlax. 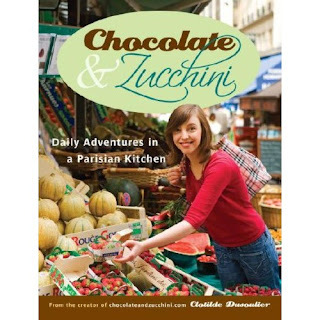 Decide that since I really want to make something complicated and time-consuming and impressive, I should look to that most intimidating of cookbooks, Chocolate and Zucchini. Clotilde and I have an uneasy relationship--sometimes I think she's fabulous, and sometimes I think she's finicky and uses too many ingredients and I'm a devotee of simpler-is-better (not necessarily the same thing as easier-is-better). 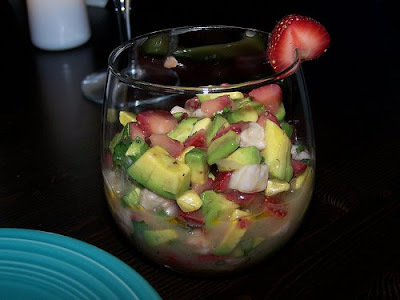 But she had a strawberry/avocado ceviche that sounded heavenly and not terribly ingredient-ridden, AND she had a souffle recipe. Of course she had a souffle recipe. She is French. But I've never made a souffle. I've never even tasted a souffle. I just know that I really, really want one. Cheesy, eggy air? What could be better? But I've heard of the legendary falling-down-ness of souffles, and having never had one, much less made one successfully, I didn't feel comfortable buying a souffle dish. Especially since I try not to buy dishes that have only one purpose. (This rule does not apply to glassware). 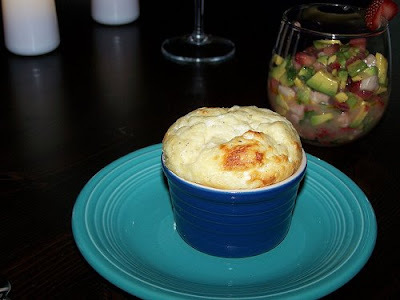 But Clotilde's souffle recipe made little souffles. In ramekins. I already have ramekins. I'm down with this plan. Still leaves dessert. Given that the souffles will be taking up the oven, and given that it's 90 degrees, I don't think I want a baked dessert. I want a frozen dessert. I am uninspired by Clotilde's desserts. I turn, somewhat trepidatiously, to Padma Lakshmi. I've been known to watch a Top Chef episode. But I hate Tom Colicchio (talk about too many ingredients). I am concerned that Padma will have similar tastes. Er, no. No indeed. I have made her chili-honey-butter grilled shrimp recipe (which really is just chili, honey, butter, and shrimp. And it's heavenly) but I didn't quite clock that all her recipes were that simple. 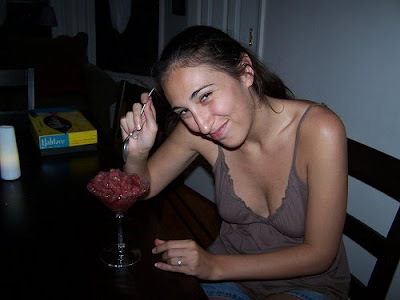 After some debate over whether the manchego-fig dish constituted a too-cheesy meal, I settled on plum granita. And then looked more closely at the recipe. It needed to chill for six hours. And it took an hour to cook. I looked at the clock. 1:00 PM: I run out the door. 1:30 PM: I arrive at the Union Square Farmer's Market. At least I think I do. It's hard to tell if there is produce behind all the people. It took me half an hour to find these items. But it was one fun half hour. I'd been to the Farmer's Market many times, but never by myself, and never with my handy-dandy mesh bag over my shoulder. That's me. Only, you know, with longer hair and an ING Direct--Save Your Money! bag. 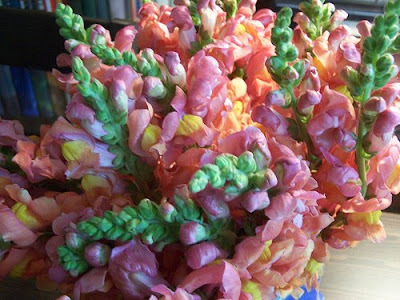 I got the fish from the fishmonger, the plums from the plum guy (and those were some amazing plums) and cilantro and flowers (not on the list, but too pretty and too cheap to resist) from the flower guy. And the cheese and strawberries and avocado from the store. The farmers had goat cheese, but they did not have comte. 2:30 PM: Begin furiously slicing plums into very small pieces. Nearly slice off thumb, which would put a damper on the rest of the meal. 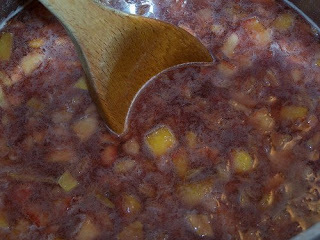 Begin stewing plums with sugar and a few cloves. Add water and a cup of grenache. cribably delicious smell fills the house. Decide that this is going to be one heck of a meal. 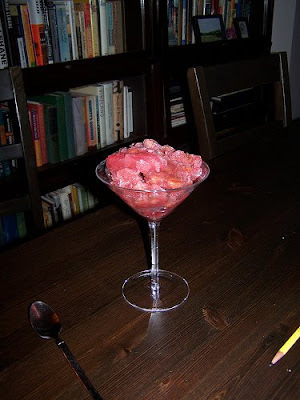 3:00 PM: Realize that if granita is to be frozen it must be placed in the freezer. Our freezer is filled with this morning's Trader Joe's run. Do some creative shoving. Dave calls. Says he will be home in ten minutes. Rudely exclaim that he wasn't supposed to be home until seven. 3:30 PM: Put Dave to work. Have him wash dishes. If he's going to come home early, he'll have to suffer the consequences. Put the swordfish in the refrigerator to marinate for two hours. 4:30 PM: Excuse Dave from dishwashing duties to go load New Wave music onto iPod. Call him back repeatedly as emergencies come up. And come up emergencies do. Because now I'm making the souffle. Furiously whisk. Make passable bechamel. Furiously whisk in egg yolks and cheese. Furiously whip up egg whites. Very very carefully fold in the egg whites. Have no earthly understanding of how on earth one is supposed to blend these ingredients without smooshing the egg whites. 5:30 PM: Twiddle thumbs impatiently as various dishes marinate, freeze, and settle. Chop avocado, strawberry, and cilantro. 6:30 PM: Come from behind to resoundingly defeat Dave in Yahtzee. Obsess over beauty of the flowers. Watch oven for twelve minutes as souffles rise. Everything is delicious. A souffle is all I dreamed it would be. The touch of nutmeg in the recipe (which kind of freaked me out) gave it a surprising depth. The ceviche had a pleasant amount of heat (I might add more next time) and I loved the swordfish with it. I've had a hard time working with swordfish in the past--it gets tough so easily--but the citrus-cooking made it chewy and soft and very good. 8:00 PM: Recover enough room in our bellies for dessert. I've been working on my presentation. I may not have much in the way of serveware, but I have great glassware. It's delicious. Possibly a little sweet, but so refreshing, and so tasty. I feel a little smug. That sounds like a long day!